An employee starts his/her career with lots of happiness, but after the days are passing he/ she may face some problems practically the problems may be health based, financial, journey etc. Mainly teachers face journey problems because teachers can't stay at the working place due to some family conditions/problems. So, they should leave the native place and adjust in the rented houses.If their children are grown they have to move the rural areas nearer to the colleges of their children. Not only this for medical assistance/treatments they have to live in the rural areas. Travelling from rural to urban with out proper transport facility is very problematic. So,to overcome such problems and reducing the distance of travelling, changing the atmosphere are the factors which shows a great impact on the teacher. These can be solved by transfers.By transfers teachers can choose the place according to the seniority service etc. So, every teacher will wait for particular situation and ready to move the other place and work with more energy. But leaving old place, many times it is painful, because teacher is closely associated with students, villagers, SMC members, parents etc. But transfer is a part of job and it is compulsory &amp; essential. The draft teacher transfer schedule of A.P would be released in June 2017. This schedule includes rationalisation, transfer. As govt, is ready to close the zero enrolment schools. 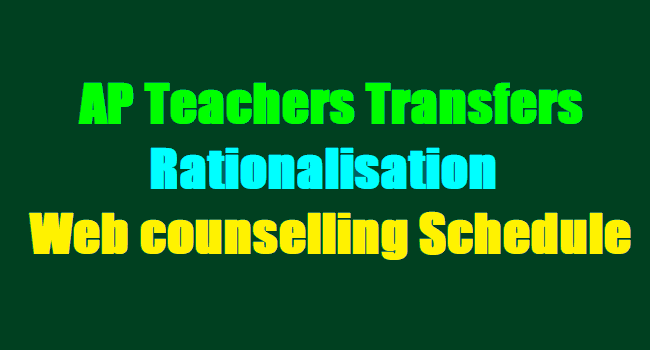 The rest of transfers will be continue through the web counselling process. The schedule includes important dates of applications, seniority list, objections final list, counselling to be held etc. So, get ready to the new process in the new state. Do not confuse while giving options of the place, have a glance on the vacancies and them move forward carefully. It will become earlier. 16 Display of transfer orders the Web and issue of orders (hard copy) by the concerned authorities (Allotment should be generated for all categories of the posts to the applied candidates (District wise, category wise, Medium wise and subject wise basing on the web-options given by the individuals.